Recently Gary Becker in the Becker-Posner blog opined that “I believe much of the blame rests with the fact that many children from minority families are raised with a single and not very educated parent, and that the quality of the schools attended by minority children is deficient.” This is quite a pessimistic statement considering it has been 50 years since the publishing of Becker’s seminal work on the economics of human capital ‘Human Capital: A Theoretical and Empirical Analysis, with Special Reference to Education’ (1964). Below is a high level summary of the factors effecting academic outcomes associated with school choice. 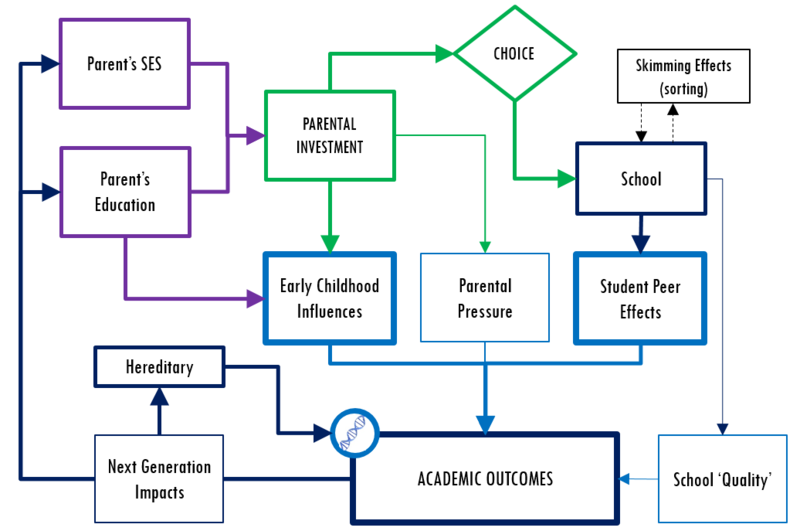 Factors affecting academic outcomes and generational mobility are complex and highly endogenous. I will add a number of posts on this specific topic over time as I try to tease out all the factors and try to draw logical and consistent connections between these factors. Becker, G. S. (1964). Human Capital: A Theoretical and Empirical Analysis, with Special Reference to Education.